How much is the freelancer registration fee? Sribulancer works 100% FREE for both client and freelancer, whether for registration, job posting or job application. 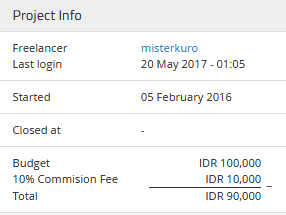 Sribulancer only charge a 10% commission fee of the total project amount to freelancer. Client pays IDR 1.000.000 for the project amount. Note : Freelancer is also responsible for the transfer fee that is incurred during transfer transaction to your selected bank account. If you have any questions, you can contact us at: +62 855 746 77577 or email to ask@sribulancer.com.